In 2012, Riskflow Technologies, a niche company providing tools for Risk and Cash Flow management, embarked on an ambitious project to develop a multi-device cashflow optimising app that can be used by individuals and businesses to see the future impact of their financial decisions. The major motivation for developing the app was to provide a practical, affordable and accessible tool for financial literacy. Statistics from 2013 indicate that more than 25% of South Africans are unemployed. The SA government's job creation programs having not been successful, and experts world-wide agree that the solution to the unemployment woes (in South Africa as well as the rest of Africa) is to create a healthy and significant SMME (Small, Medium, Micro Enterprises) sector. By mid-2013, 5 out of 7 businesses formed in South Africa 2011 had already failed, and in almost all cases the failure was brought about due to lack of cashflow, which in turn is closely linked to the lack of financial literacy. Riskflow has been involved in financial literacy training for a number of years and had, for that purpose, developed a spreadsheet solution as a training tool. An app was a logical next step; make it simpler and easier to use (yet more comprehensive), make it sexier and make it available to people without access to Microsoft Excel. The app offers 2 distinctly different profiles (which can be accessed by the same user) – Cashflow Optimization for Individuals (CFO4i) and for business (CFO4b). Individuals are intuitively guided through a series of input screens capturing their current income, expenses, financial assets, liabilities and debt. As the user becomes more familiar with the app, the screens are expanded to "show the future". 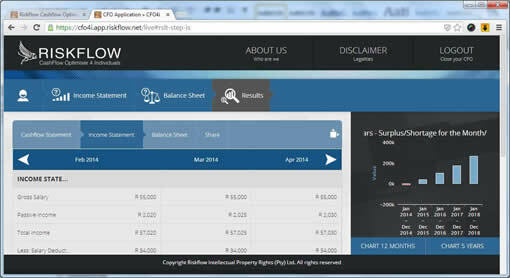 The end result is a set of integrated financial statements (Balance Sheet, Income Statement and Cashflow statement) with simple graphics, displaying forward-projected values for the next 5 years. CFO4b follows the same logical flow, but expanded so as to include business-related information (staff, regulatory expenses, and so on). 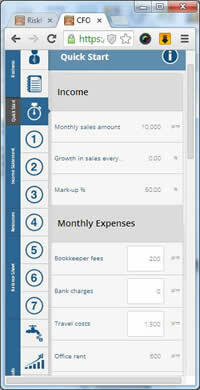 To ensure that the small business owner is not over-awed when first using the app, CFO4b has a Quick Start option. By answering 20 or so very simple questions, the user can very quickly go to "Results" and see the state of the finances – current as well as over a 5 year projection period. 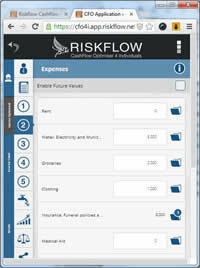 Why not try the app for yourself at the Riskflow website? Click on register (top right hand corner) and complete the form. There are two ways to get access – via a voucher number or via PayPal. However, you get a 14 day free trial period before you have to pay. Under the headline "The Riskflow Group – revolutionising cash flow technology", Leadership Magazine July 2014 features a corporate profile of Riskflow. Leadership Magazine is aimed at dynamic middle and senior business managers and Directors, entrepreneurs, an influential political class and those who aspire to leadership roles, across all sectors of the economy. Leadership Magazine is one-on-one with leaders within South Africa and around the word, learning from them and their personal stories of what it means to be leader. The Magazine's insights and analysis of situations within the country brings forth an intelligent interaction with what is happening in the world today. We would like to extend our thanks to Leadership Magazine, which has kindly allowed us to share the article in PDF with DYALOGue readers.